The new earrings and pendant (on leather cord here) shown with a 4 knot gold bracelet for size comparison. For a long time I have searched for a design for pendants and earrings that would properly complement our wide range of elephant hair knot style bracelets (aka love knot bracelets). Half our audience probably doesn’t care, as they are men. But ladies have often asked me for these common accessories. At times we even imported some different knot and ring designs from East Africa. Plus our competitors emphasize the knots themselves in their designs. But only insiders understand the story and embrace the pedantic look of the individual knots. Like all great designs, the final solution turned out to be elegantly simple. 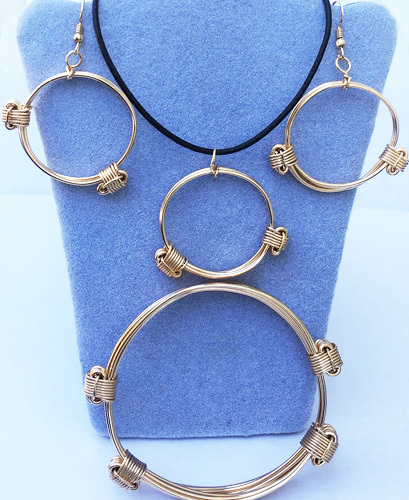 The trick was to figure out how to make a very similar circular two knot design in small size but with the same gauge full round wires as used in the bracelets. (Hint: It takes strong fingers and a jig). The fashion pundits of the world have said to expect lots of big circle, dangly earrings in 2016 and we couldn’t help but be prouder to make their forecast come true. And, of course, they come in silver, gold, silver with gold knots, rose gold and artificial elephant hair. Do you like them as they are? Do you play with the sliding knots? Do you want to see some of our 3D charms or little Africas hanging inside the circles? Do you wear them even when you don’t have a matching bracelet on? Keep us posted and enjoy wearing love knot pendants and earrings as this unique line develops.